Whether you are a parent, educator, or community member, you can help turn political rhetoric about "investing in the future of our children" into reality. Make the case for why we need to educate the whole child now. 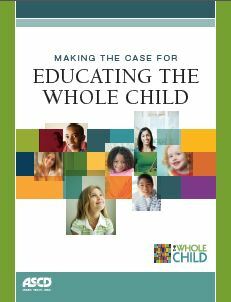 Use Making the Case for Educating the Whole Child as an advocacy tool as you work with policymakers, the media, and other groups. This free resource provides critical research and real world examples of education policies and practices that ensure students are healthy, safe, engaged, supported, and challenged. In short, it will help you make the case for what we know works. Use this form to make the case for a whole child approach to education to your local principal, superintendent, school board, state board of education, and other policymakers. This is your chance to add your local statistics and success stories to the Making the Case document so that decision makers in your community understand the difference a whole child education can make. Step 1: Open the form using Adobe Reader and save a copy to your computer. Step 2: Enter your name and/or the name of your school/district/county/state—whatever you need to label your particular case—into the first text field. The Annie E. Casey Foundation's KIDS COUNT Data Center—data by state, county, and voting district on items such as graduation rates, children living in poverty, and health insurance coverage. The National Center for Education Statistics' Data Tools—data concerning census information, crime statistics, class sizes, and teacher qualifications. The Center for the Study of Social Policy's PolicyforResults.org project—data trends on indicators such as childhood obesity, early literacy, and juvenile detention. The Centers for Disease Control and Prevention's Youth Risk Behavior Surveillance System—data on priority health-risk behaviors including tobacco and alcohol use, physical inactivity, and experience of violence among youth and young adults at the national, state, and local levels. The Child Trends DataBank—the latest national trends and research on over 100 key indicators of child and youth well-being, including health and safety, education, and behaviors. The Robert Wood Johnson Foundation Commission to Build a Healthier America's Education and Health Calculator—a tool to compare state data. Step 4: Enter your "Case in Point" in the third text field. (See examples on pgs. 5, 7, 9, 11, and 13.) Use this space to tell your success story of ensuring that each child is healthy, safe, engaged, supported, and challenged or explain how the data you cited are reflected in your school or district. Step 5: Save the file and print. As you make the case, share your strategies, tips, and stories with us on the Whole Child Blog. No matter how large or small, share what you are hearing, seeing, and experiencing. Think Locally Before Acting Globally—As a constituent, you carry considerable strength. You have the power to vote for or against elected officials. Your voice matters most, so begin working with those who represent you. Begin Early—Effective advocates don't introduce themselves the morning of a vote; they build a relationship over time. When working with a school board or local government, you may already know the elected officials, especially in small towns. If not, that's OK. Introduce yourself and begin building your relationship. Build and Establish the Relationship—Working with elected officials, like any collaborative project, means you need to establish and build a relationship. This doesn't mean sending flowers or buying dinner—it means forming a good working relationship. Instead of calling or e-mailing to simply complain, offer your help, skills, and knowledge on the issues and ask your officials if they need volunteers or advisory information. Also, never underestimate the importance of their staff. These folks are critical in the process, and their job is to advise your elected officials on the issues. Often they are more accessible, so your relationship with the staff is as important as your relationship with the officials. Help them to help you. Do Your Homework—Try to learn what you can about your elected officials in the beginning. They all have biographies, and you'll find plenty of information about them by searching government and legislative Web pages. Take a few minutes to see what you can learn. Many times you'll find common ground or similar backgrounds (e.g., you both went to the same schools or were involved in the Girl Scouts or Boy Scouts). These connections count. Know Your Key Messages—When meeting or speaking with a policymaker, you may not have a lot of time to make your case and "ask" for your desired action. Be prepared to be interrupted and to have your meeting shortened. Have your entire meeting content down to three minutes or less. Should the schedule work out and you have more time, that's great, but be prepared to "cut right to the chase." Given the hectic schedule of policymakers, you may end up meeting with staff members at the last minute. Should this occur, remember to build and establish the relationship. Focus—Remembering to focus your meeting is closely related to knowing your key messages. Many times elected officials may want to discuss other unrelated issues. Sometimes this is done intentionally, like when they prefer to discuss the local fair instead of the whole child. Be polite, courteous, and respectful, but get back on track. Remember your time is limited; it would be a shame not to spend it discussing the whole child. Anticipate Questions—Prior to a meeting or phone conversation with a policymaker or staff member, it is helpful to prepare by anticipating questions you may receive. You may want to practice with other advocates and come up with a list of most frequently asked questions. Remember that "I do not know" is an acceptable answer. Take note of the question, find the answer, and report back to the office. Doing so helps build the relationship and your credibility. WARNING: Just like when you were a kid, it is never, under any circumstances, acceptable to make up an answer. Doing that will destroy your credibility. Get Your Issue on the Record—Ask your elected officials and their staff where they stand on the issue. Ask if they will support or oppose the issue when it is considered. Ask if they will sponsor or cosponsor the legislation or resolution. They may not give you an answer that day, but it is appropriate to ask. It is also appropriate to follow up and ask how they voted on the issue and why. Follow Up—Always make sure that you follow up on all meetings and calls with e-mails or letters. Be sure to thank the participants for their time and use the opportunity to restate your position and request. You may also want to include some supporting documentation if it is helpful and relevant. Just make sure you remember to say thank you and be gracious, even if the meeting did not go well. R-E-S-P-E-C-T—Although you may vehemently disagree with a policymaker on an issue, listen to his or her point of view as it may provide insight that can be shared with others. Use the opportunity to convey your point of view. Differing views and legitimate disagreement over policies are fundamental ingredients of effective advocacy. Disagreement on one issue does not mean you will not agree on another issue. Agree to disagree, be courteous, and move on. You will gain more than you lose.